One of my favourite times of winter is when the lakes freeze over. There is just no better way to walk the dog than to watch her rip over the vast empty space. On bright sunny days, with the snow glittering over the tree branches, I don’t even notice the cold. Luckily, no one else is brave enough to face the temperatures, so we usually have the space to ourselves. 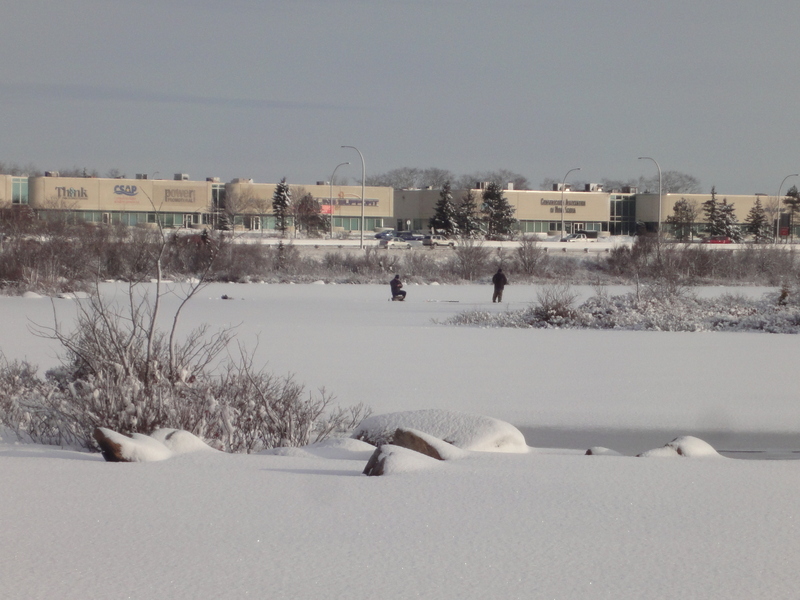 Except for a few brave ice fishermen, the lake is ours. This brief period just doesn`t last long enough. Before too long it will be February and the rain and slush will return. We have to get our ice running in while we can. I don`t know if there is a camera in the whole that can accurately capture Shiva`s joy. On days like these, who needs summer? ← Announcing the Winner of Pet Naturals of Vermont Giveaway! So pretty! I love walking my dogs in the winter. 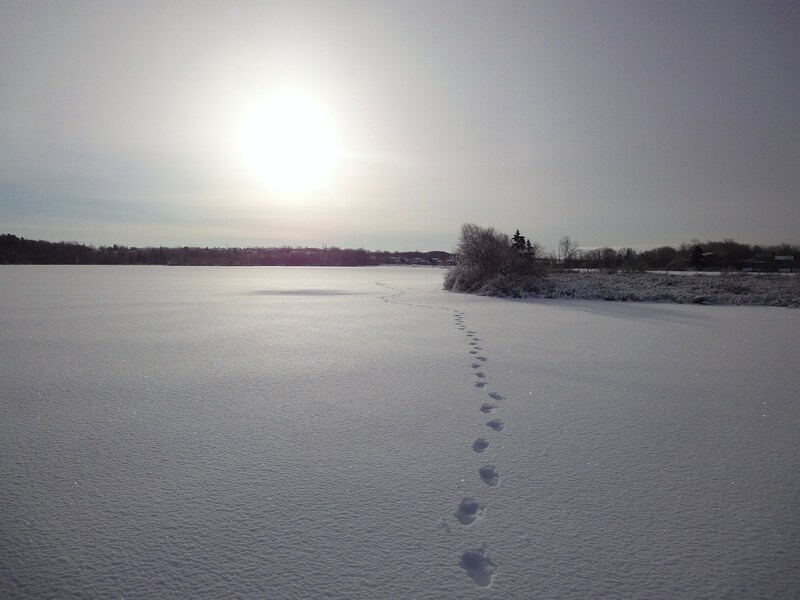 There’s nothing better than getting to leave fresh footprints in the snow. No wonder Shiva looks so happy. Our lake is too big to freeze entirely. When it gets really cold, it will freeze to about 200 feet from shore. I know someone who likes to go ice kiting on the ice. It’s horrifying to see how close he gets to the edge of the ice. i think i remember this walk and place from last winter. is this where you shot that vid? so cold. SO COLD!!!! even just looking at it. Love the pictures! I hasn’t gotten cold enough up here for freezing lakes yet… this morning my whole yard was a big pile of slush from the snow we got over the weekend, the rain yesterday, and the 45 degree temps this morning! Crazy winter. Hi Kristine, we know how much Shiva likes being out there. When we get snow out here, especially the very first snowfall, I’m out there zooming around, as are my brothers and sister. There’s something about zipping around in the stuff, making new tracks and stuff that makes us all jump around with joy. Hope you have a good one. That is one thing I miss about moving away from the snow and ice, the fresh footprints in the snow. On the other hand, I enjoy seeing your photos more than doing it. She looks so serious, staring into the camera lens. The pictures look so serene, so pretty. Looks like a perfect winter wonderland, and I (with the mucky rainy weather we’ve had all winter) am jealous! Fabulous, that looks like heaven to us. Enjoy, enjoy! Your pictures don’t even make it look as cold as it *has* to be to get that much snow! 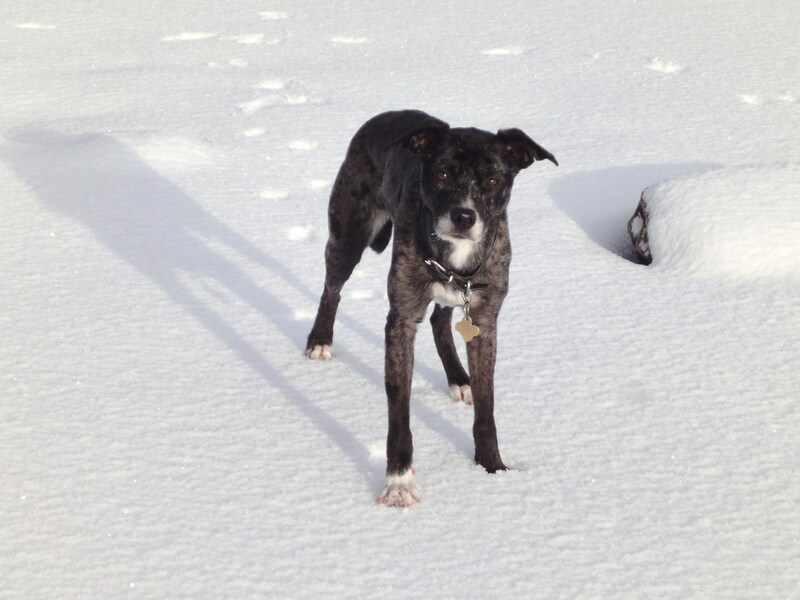 Which leads to me thinking/wishing that P-town would get enough snow just so Elli could frolic like Ms. Shiva. But then I remember how cold it must be… lol. 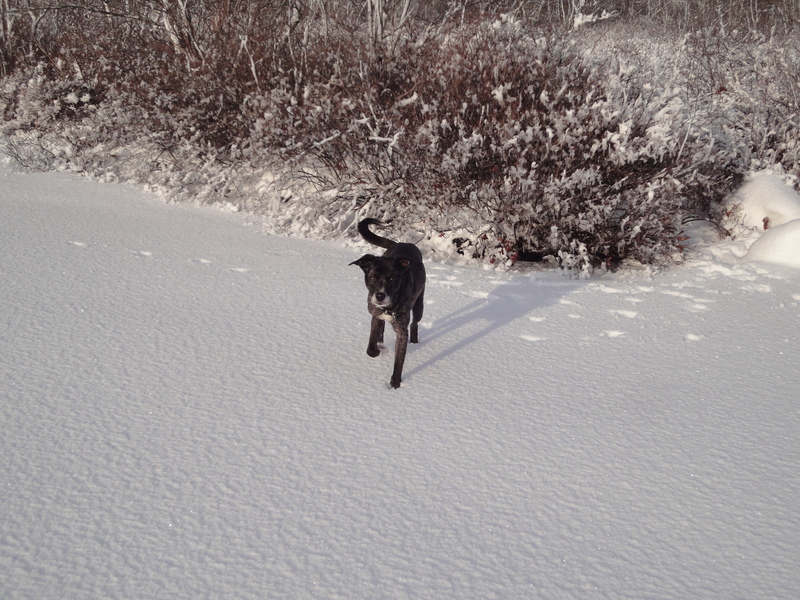 Shiva certainly does look happy … and not the least bit cold! 🙂 Enjoy your winter fun! I don’t think I could trust her in that vast open space. Shiva does look happy though. that is amazing!! thankyou for the photos, they are certainly helping me visualise staying cool…. we have a whole week of forecast temps of 40deg celscius (which I think is about 110 or 120 deg F), and the dogs are struggling with it! It reminds me of going out on the lake behind my dad’s house and skating out there in the winter after a hard freeze! You’re right, it’s a great place for a romp! I think that last picture says it all. 🙂 Shiva is such a beauty! I love these photos! Great pictures! And I am envious of your great walk location. Super cold and still winter days when it’s just me and the dogs out are my favourite. And getting to be the only ones to put footprints in that snow? Awesome. 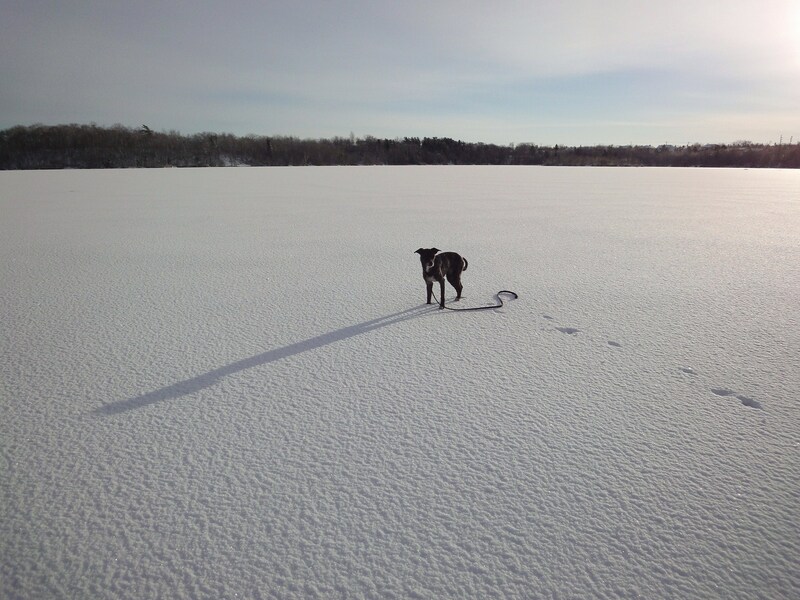 This is amazing you dog is walking in the snow..Beautiful photo you shared..Thank you..
I’m not sure a camera could capture MY extreme joy at flinging myself all over that snow covered ice! In fact, I want to be there so badly right now that I can feel the cold snowy air chilling my airways. I am so bummed that winter has skipped Virginia this year! Ahem. Enjoy it all you can before it turns to slush!